GeoNet reported a small hydrothermal eruption in Lake Rotorua on 28 November, and noted that the occurrence was not unusual. In a news article residents described a geyser that rose 20-30 m above the lake surface. A GNS scientists noted that the last significant steam eruptions in Rotorua occurred about 15 years ago. BGVN 26:03 reported hydrothermal activity at Rotorua on 26 January 2001 involving the ejection of mud and ballistic blocks. BGVN 28:12 reported that the New Zealand Institute of Geological and Nuclear Sciences reported two subsequent hydrothermal eruptions in Rotorua caldera at Kuirau Park around 1100 on 6 November 2003 (figure 5). The eruptions occurred just meters from the site of the large blowout in 2001. The area is known for this kind of geothermal activity. The following information is primarily from Ashley Cody. Figure 5. Rotorua is the NW-most caldera of the Taupo volcanic zone, in the Bay of Plenty region of New Zealand's North Island. Courtesy of UNAVCO. In late May 2004 a geothermal well ~ 40 m deep at Tokaanu on Lake Taupo (~ 100 km S of Rotorua) blew out suddenly, erupting mud and scalding waters to ~ 15 m high and flooding surrounding properties for several days until it could be quenched and a new headworks fitted. This well may have been standing open and just suddenly began boiling, since its casing seemed to be intact. About 0100 on Saturday 29 June 2004 the blowout of a geothermal well in Rotorua blew muddy water and rubbly debris to ~ 15 m high and showered muck over houses and cars to a radius of ~ 100 m accompanied by noise "like a jet aircraft." It went on until about 0400 on 30 June 2004 when it was quenched with a pumped cold water supply. It was cement-grouted shut a few days later. The well was 100 m deep and cased to 47.5 m.
Starting 18 July 2004 in the early afternoon, many earthquakes were strongly felt by many people in the area ~30 km N of Rotorua and ~20 km NW from Kawerau, in the northern North Island, or central Bay of Plenty. By 23 July more than 200 earthquakes were recorded in this area, most at less than 10 km depth. In Lake Rotoehu, about 20 km N of Rotorua city, eyewitnesses reported a water column 100 m high that occurred at the same time as a strongly-felt ML 5.4 earthquake at about 1600 on 18 July 2004 at ~5 km depth. Shortly afterward a big series of waves occurred on the lake, and swept up beaches much higher than ever seen before. Ground rupturing was reported at several sites along southern shores of Lake Rotoehu. Many houses were evacuated due to damage such as walls breaking apart and houses shifting off their foundations. The main road was blocked in many places and more than 200 houses were evacuated due to their becoming unsafe to live in. Several people were killed by trees falling down banks onto cars and houses during the earthquakes. On Thursday 17 March 2005 at about 1435, a blowout was observed from the northern end of Ruapeka Bay on Lake Rotorua, at Ohinemutu. It shot dark grey muddy waters and steam to ~ 6 m for 3-4 minutes. An eyewitness called the council safety inspector, Peter Brownbridge. On 18 March at about 1500, the safety inspector saw two more shots each ~ 1 m high from the same spot in the lake. This previously unknown vent is ~ 25 m NW from a clear flowing hot spring known simply as S1233, in the bed of the lake just 10 m W of the tip of Muruika Point. This is where a prehistoric account relates of a sunken village, where a sudden disturbance occurred one night and many people were killed. From verbal genealogy records, this event may have occurred about early 1700s-1720s. Today rows of timber posts are still standing below water level in the lake here. According to a report in The Dominion Post by Mike Watson on 21 April 2005, one of the largest hydrothermal eruptions in the Rotorua area since 1948 took place about 1030 on 19 April 2005 and was witnessed by two farmers (figure 6). Figure 6. The geothermal eruption roughly midway between Rotorua and Taupo on 19 April 2005 left a 50-m wide crater. Courtesy of Ashley Cody. A huge column of hot steam, mud and rocks was thrown 200 m in the air. The eruption happened in an inaccessible area at Ngatamariki scenic reserve, close to the Waikato River, and about 8 km from Orakei Korako geothermal springs, roughly halfway between Taupo and Rotorua. The column was visible 10 km away and left a 50 m-wide crater and two hectares of debris. With the energy now taken out of the vent, no further eruption was expected. The major part of the eruption lasted about two hours but it was still spewing steam up to 10 m high five hours later. The eruption sent out 7,000-10,000 m3 of material. Mud and 50 cm-diameter rocks covered a 70-100 m radius from the crater site, which had previously been covered by 2 m-high blackberry bushes and fallen trees (figure 7). The ground may take months to cool. According to Ashley Cody, the site had been heating up in the past year, with three new hot springs forming. Figure 7. The hydrothermal eruption roughly halfway between Taupo and Rotorua left ash and mud covering the surrounding area to a depth of 4 m (light-colored material on ground surface, coating some trees, and choking the stream). Courtesy of Ashley Cody. Information Contacts: Ashley Cody, Consulting Geologist, 10 McDowell Street, Rotorua, New Zealand; Ron Keam, Physics Department, The University of Auckland, Private Bag 92-019, Auckland, New Zealand; Mike Watson, The Dominion Post. Two eruptions occurred at Kuirau Park in Rotorua caldera around 1100 on 6 November. They blasted mud, rock, and ash 14 m into the air. Gray mud and small rocks littered a zone ~20 m wide. The eruption destroyed trees around the crater. The eruptions occurred just meters from the site of a large blowout in 2001. The area is known for this kind of phreatic activity. A vent in Kuirau Park in Rotorua ejected a small amount of hot mud, most likely on 8 April. The IGNS reported that on 27 March a very small eruption of mud and water occurred from a vent in Kuirau Park, Rotorua. The park was the site of a large eruption in late January 2001. The IGNS wrote, "On Friday 26 January at about 1530 to 1540, a muddy hot pool (Spring 721) erupted violently in the largest hydrothermal eruption in Kuirau Park since 1966. Blocks of rock debris and mud were blasted to a height of about 100 m. Blocks up to a meter in diameter were blown over 50 m from the vent, with fragments up to 10 cm landing over 100 m away. The steam cloud from the eruption was visible several kilometers away." The eruption deposited debris 120 m to the E of the vent and ~30 m to the W. The original hot pool was about 3 meters in diameter; the newly formed crater was about 10-12 m in diameter. On 18 September 2000, a new feature was formed at a private property along Tarewa Road as a result of a small-scale weak hydrothermal eruption. About 0530 on 18 September, spring 653 erupted, producing waves and surges, but eyewitnesses did not report any significant eruption column. Surge marks were especially well developed to the N within a newly constructed bund, an earthen structure designed to capture the fluids from eruptions. At 0545, eruptive activity began at a new site ~15-18 m S of spring 653. The eruption may have been triggered by the removal of a clothesline mast and subsurface anchoring concrete block three days earlier. Residents reported that heating was occurring in the same area several weeks before the outbreak. Vigorous activity was estimated to have lasted about 5-10 minutes before activity started to decline. Small-scale hydrothermal eruptions have been reported in the past from nearby sites. Information Contacts: Brad Scott, Wairakei Research Center, Institute of Geological and Nuclear Sciences (IGNS), Private Bag 2000, Wairakei, New Zealand (URL: http://www.gns.cri.nz/). This report provides more details on the previously reported, small-scale hydrothermal eruption on private property that occurred on 18 September 2000 (BGVN 25:08). That report contained an ambiguous statement. Brad Scott refined the statement that several small-scale hydrothermal eruptions "were reported" in the past year; the passage should have read that such eruptions "have occurred" in the past year. Scott noted further: "The increase in activity is related to the closure of many geothermal wells within Rotorua City as part of a management scheme designed to preserve the surface geothermal features." For further details see Scott and Cody (2000). Surface features resulting from the eruption can be seen in figure 1. The twisted metal pipes are related to an old bath house, which used to stand near the clothes line mentioned in BGVN 25:08. The pipes fed water to the bath house and were excavated by the eruption. The original clothes line was completely removed off site before the eruption occurred. Figure 1. A photo showing the disrupted area caused by a small hydrothermal eruption at Rotorua on 18 September 2000, as seen later that day. The eruption left this collapse vent and fine mud. The eruption also brought up and deformed some previously buried metal pipes. Courtesy of Brad Scott, GNS. Ron Keam contributed the following hazards assessment to the GOSA electronic list (geysers@wwc.edu). "If the area of an average house at Tarewa Road were one tenth of the average section area, the probability that the focus of one of these revived activities would occur beneath a dwelling is roughly 10%. So far, with three or four incidents having occurred, I think that the houses themselves were spared from direct participation in the initial events. With the average craterlet enlarging itself somewhat, there must be a comparable probability that an average sized house would in due course find itself partially overhanging the craterlet. So, in all, there appears to be something like a 20% probability that an outbreak on an average property would make a dwelling there uninhabitable. A search of an index to the Geyser Observation and Study Association (GOSA) newsletter revealed two articles referring to Rotorua breakouts due to hydrothermal activity (see References below). Ashley Cody also discussed Rotorua hydrothermal features (Cody, 1998). 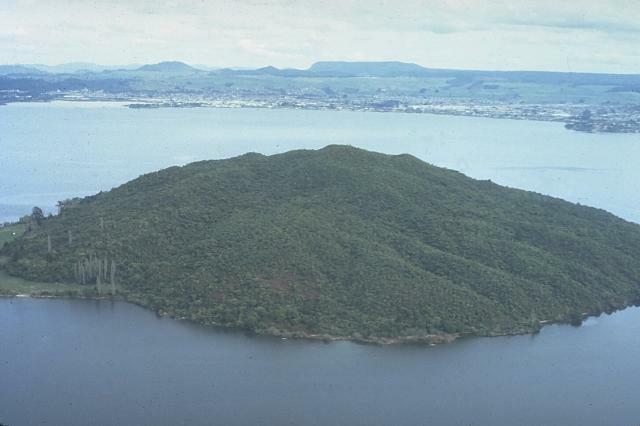 Note that the elevation of Rotorua city is about 320 m; the 575 m stated in the header above refers to the highest point on one of the young domes within the caldera. All of New Zealand's recognized Holocene volcanoes lie on North Island or just to its N. Rotorua sits in the northern part of the Taupo volcanic zone between Lake Taupo and the Bay of Plenty. The Okataina lava domes lie ~20 km E of Rotorua. In related hydrothermal activity on Rotorua, the Pohutu Geyser at the active geyser area Whakarewarewa has been in continuous eruption for 251 days, a new and continuing record for New Zealand. References. Cody, A., 1998, GOSA Transactions, The Rotorua Geothermal Field, New Zealand: Geysers in New Zealand, v. VI, p. 34-49. Geyser Observation and Study Association (GOSA) newsletter, 1998, "The Geyser Gazer Sput." (v. 12, no. 3, p. 23; v. 12, no. 4, p. 11) (December 1998). Monteith, David, 2000, Index of "The Geyser Gazer Sput," December 1987 - December 1998 (http://www.geocities.com/Yosemite/1407/Sputind.htm). Scott, B.J., and Cody, A.D., 2000, Response of the Rotorua geothermal system to exploitation and varying management regimes: Geothermics, v. 29, p. 573-592. Information Contacts: Brad Scott, Wairakei Research Center, Institute of Geological and Nuclear Sciences (IGNS), Private Bag 2000, Wairakei, New Zealand (URL: http://www.gns.cri.nz/); Ron Keam, The Physics Department, The University of Auckland, Private Bag 92-019, Auckland, New Zealand. On 26 January, from 1530 to 1540, Spring 721 (figure 2), a muddy hot pool ~2.5-3.0 m in diameter, generated the largest hydrothermal eruption in Kuirau Park since 1966. Blocks and other ejecta rose as high as ~100 m and produced a thick deposit extending more than 120 m E of the vent (figure 3). Blocks up to 1 m in diameter were thrown 50 m from the vent, while smaller blocks less than 0.1 m in diameter landed 100 m away. Ejecta reached less than 30 m to the W. The resultant crater had a diameter of 10-12 m.
Figure 2. Spring 721 steaming shortly after the Rotorua mud eruption. Note ejected mud and blocks, and mud-coated, damaged vegetation in the background. Courtesy of Brad Scott. Figure 3. View near the deposit margins at Rotorua showing mud and blocks. Courtesy of Brad Scott. Four distinct deposits from the eruption were recognizable on the evening of 26 January. The first unit was a dark gray hydrothermal mud spilt onto an adjacent road W of the vent. This mud appeared to be the pre-eruption contents of Spring 721. A ballistic block bed was the most widely distributed unit, and was composed almost entirely of rocks from the Oranui Formation. Ballistic blocks were found overlying the mud deposits as well as lower down in the sequence coated by mud with sheltered zones on the leeward sides; this indicated that block ejection was active throughout the eruption. A widespread dark gray mud was deposited SE of the vent with a thickness ranging from 400 mm to only a few millimeters at Ranolf Street. A smaller, slightly darker, gray mud deposit E of the vent, overlayed the prior mud with a maximum thickness of 100-150 mm. The main phase of the eruption was inferred to be followed by a smaller mud-rich shower, preceded by distinct ejection of centimeter-sized ballistic blocks that impacted into all of the mud deposits. These blocks extended well beyond the mud NE of the vent, and their relationship to the mud deposits could not be clearly determined. Mud fallout coated trees and shrubs within the ejecta apron, bending and breaking many of them (figure 4). Figure 4. Bent and broken vegetation coated by erupted mud from Rotorua. Courtesy of Brad Scott. References. Wilson, C.J.N., Rogan, A.M., Smith, I.E.M., Northey, D.J., Nairn, I.A., Houghton, B.F., 1984, Caldera volcanoes of the Taupo volcanic zone, New Zealand: Journal of Geophysical Research, B, v. 89, no. 10, p. 8463-8484. Wilson, C.J.N., Houghton, B.F., McWilliams, M.O., Lanphere, M.A., Weaver, S.D., Briggs, R.M., 1995, Volcanic and structural evolution of the Taupo volcanic zone, New Zealand; a review: Journal of Volcanology and Geothermal Research, v. 68, no. 1-3, p. 1-28. Information Contacts: Brad Scott, Wairakei Research Center, Institute of Geological and Nuclear Sciences (IGNS), Private Bag 2000, Taupo, New Zealand (URL: http://www.gns.cri.nz/). Reported hydrothermal activity at Rotorua on 26 January 2001 involved the ejection of mud and ballistic blocks (BGVN 26:03). The New Zealand Institute of Geological and Nuclear Sciences reported that two subsequent hydrothermal eruptions in Rotorua caldera at Kuirau Park on 6 November 2003 blasted mud, rock, and ash 14 m into the air. Gray mud and small rocks littered a zone ~ 20 m wide and the eruption destroyed trees around the crater where it vented. The eruptions occurred just meters from the site of the large blowout in 2001. The area is known for this kind of geothermal activity. The 22-km-wide Rotorua caldera is the NW-most caldera of the Taupo volcanic zone. It is the only single-event caldera in the Taupo Volcanic Zone and was formed about 220,000 years ago following eruption of the more than 340 km3 rhyolitic Mamaku Ignimbrite. Although caldera collapse occurred in a single event, the process was complex and involved multiple collapse blocks. The major city of Rotorua lies at the south end of the lake that fills much of the caldera. Post-collapse eruptive activity, which ceased during the Pleistocene, was restricted to lava dome extrusion without major explosive activity. The youngest activity consisted of the eruption of three lava domes less than 25,000 years ago. The major thermal areas of Takeke, Tikitere, Lake Rotokawa, and Rotorua-Whakarewarewa are located within the caldera or outside its rim, and the city of Rotorua lies within and adjacent to active geothermal fields. Horwell C J, Patterson J E, Gamble J A, Allen A G, 2005. 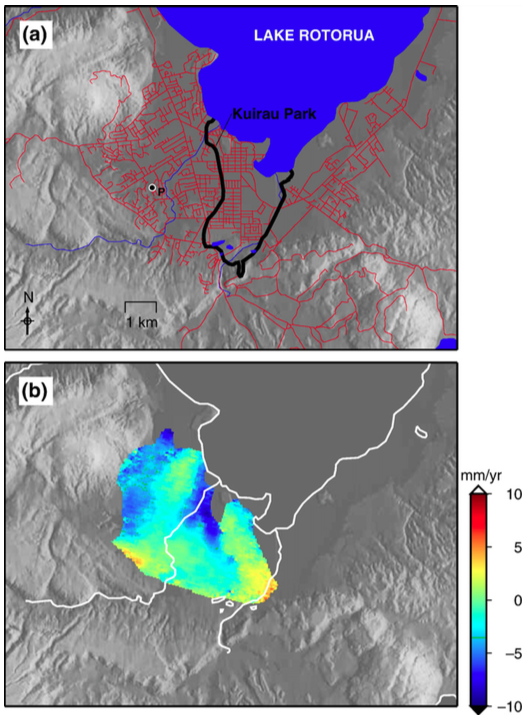 Monitoring and mapping of hydrogen sulphide emissions across an active geothermal field: Rotorua, New Zealand. J. Volcanol. Geotherm. Res., 139: 259-269. Milner D M, Cole J W, Wood C P, 2002. Asymmetric, multiple-block collapse at Rotorua caldera, Taupo Volcanic Zone, New Zealand. Bull Volcanol, 64: 134-149. Milner D M, Cole J W, Wood C P, 2003. Mamaku Ignimbrite: a caldera-forming ignimbrite erupted from a compositionally zoned magma chamber in Taupo Volcanic Zone, New Zealand. J. Volcanol. Geotherm. Res., 122: 243-264. The Global Volcanism Program is not aware of any Holocene eruptions from Rotorua. If this volcano has had large eruptions (VEI >= 4) prior to 10,000 years ago, information might be found on the Rotorua page in the LaMEVE (Large Magnitude Explosive Volcanic Eruptions) database, a part of the Volcano Global Risk Identification and Analysis Project (VOGRIPA). Remarks: Long-term subsidence is associated with the Rotorua geothermal field. (a) Location map of the Rotorua geothermal field showing lakes and rivers (blue), road outlines (red) and the boundary of the geothermal field determined by surface activity and drilling (Wood, 1992). (b) ERS stack of independent interferograms 12/05/1996?09/01/1999 and 24/05/1996?20/ 03/1998 showing line-of-sight displacement in mm/year. From: Hole et al. 2007. Reference List: Hole et al. 2007. There is no Emissions History data available for Rotorua. The Global Volcanism Program has no photographs available for Rotorua. There are no samples for Rotorua in the Smithsonian's NMNH Department of Mineral Sciences Rock and Ore collection. Large Eruptions of Rotorua Information about large Quaternary eruptions (VEI >= 4) is cataloged in the Large Magnitude Explosive Volcanic Eruptions (LaMEVE) database of the Volcano Global Risk Identification and Analysis Project (VOGRIPA).